The Legend of Zelda: The Minish Cap Limited Edition was part of the promotion done for the launch of the Game Boy game. The game was originally available either as a standalone packaged game, or as part of a special pack, which included one of only 25,000 limited edition, Zelda-themed Game Boy Advance SP. The Triforce SP is matte gold in color, with a Triforce logo stamped on the lid, and the Hyrule royal family crest printed on the lower right face. I believe these may have been European only. Aside from these Zelda Limited Edition Paks available in store, Nintendo created the Limited Edition Collector’s Box, which contained The Minish Cap, the golden Triforce SP, a long-sleeved shirt and a hat. Only 300 boxes were made worldwide and each one is certificated. These Collector’s Boxes were not for sale in stores anywhere, but could only be won or bought in the Nintendo Stars Catalogue for 15,000 stars (which equadled roughly 120 games). Also, one of these is in the Nintendo World Store signed by Shigeru Miyamoto himself. 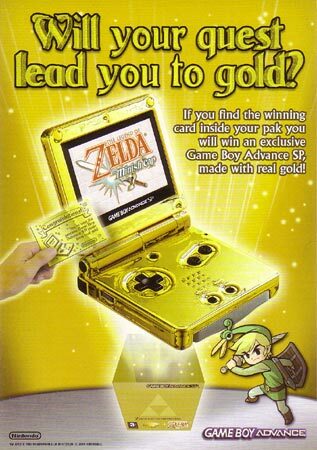 As a launch promotion, Nintendo Europe also produced seven 24-carat gold plated Game Boy Advance SP consoles, with six given away to people who found a golden ticket inside their Triforce SP package, and a seventh as a magazine promotion. In 2009 in sold for $1,043.31 and another for $817.10 (570 Euros). This one is currently $509.11 with eight hours to go. NES Test Carts and Link… On a Skateboard? I always wanted to know what happened to those 7 gold-plated SP’s. If I remember rightly, when you bought one of the regular Gold SP’s you had the chance of finding a golden ticket inside the box (think Charlie and the Chocolate Factory), which you could trade in for the Gold plated SP. I remember the Gold SP not being terribly popular though as you could buy one for months after launch, even though they were “limited edition”. Maybe they were never found? I’m sure this promotion was available regardless of where you bought the SP, but I remember UK retailer GAME advertising the promotion heavily in store. Coincidentally – I never bought one of these SP’s because of the way the Zelda game arrives loose in the box. The Game Boy Advance SP packaging was always as compact as it could have been, but then they also shoe-horned a copy of The Minnish Cap in there as well (unboxed). eugh. Makes me queasy thinking about it, but then again I always buy everything sealed. The last one went over 800 Euro if I’m not mistaken. My best estimate is this one will not exceed 400 Euro. I’d buy it but I spent so much money this Christmas. A nice piece for Zelda fans although the water stain on the bottom right of the box is disappointing. @sneakyduck – make that two of us! I bought one of these hoping for a gold ticket, but no luck. But as you say there was no mention of them, no announcement of winners, nothing! All I ever heard was a rumour that employees got them all, but I have no source to back that up unfortunately. having said that, you would have expected an employee with no love for Zelda selling one eventually, but as far as I’m aware, none have ever surfaced nor is there any record of them exisiting! Nice little scam to make us buy the Gold GBA eh? These sure didn’t hit the US shores. There might have been something similar for Japan, but we got nothing of this nature. I must have spent every day checking that website until that it went down. I just wanted to know who got them or at least see a picture of the packaging or something. I always thought it was a little suspicious how none of the tickets ever surfaced but my suspicion was, as noted earlier, that the tickets were never found. I’m sure each of the 6 stores mentioned in that press release got one to give out each – I’d hate to think the SP’s with the winning tickets are sat in some warehouse gathering dust (or even in somebody’s sealed SP variation collection) whilst the gold-plated prizes were quietly given to the execs at NOE. Heaven knows those guys don’t deserve them – their marketing efforts in the Gamecube / Game Boy days was shocking. To be honest, I don’t think they ever existed. A solid gold Gameboy Advance? How much would that have cost to make, surely too much to give away, right? It wasn’t solid gold, just gold plated. Doesn’t look like a waterstain to me. It doesn’t say anything about it in the auction either: it’s a spot. Seems like you could fix that, because it’s prolly a smudge of something. 400 euro is not enough BY FAR. This one will go over 700 euro’s. Odd thing to write considering that you are the seller. Ended at EUR 600.00 ? gosh is there any way i can get one of these? I have a Zelda addition GBA SP. They were also available in australia without the game. I still play my first Mario game on it to this day. I last played it two days ago actually. That’s awesome, dude. I have one too. GBA was easily one of my all time favorite handheld systems! Wondering if you still have the box? Love to see a picture.